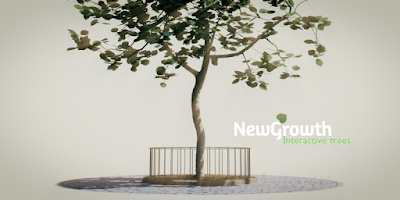 one of the issues that bothered me about my new tree add-on was that applying the skin modifier to flesh out the branch skeleton was incredibly slow, especially for larger trees. 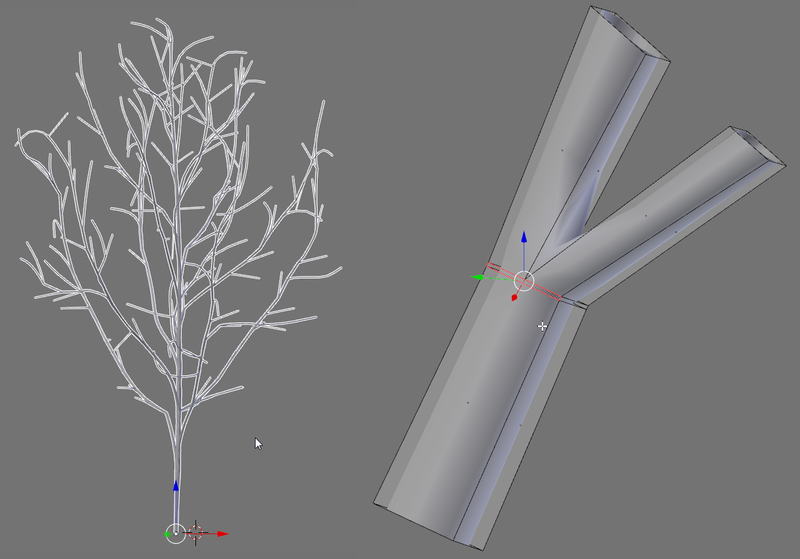 I therefore decided i'd try writing my own skinning routine and the results are quite promising: a factor 10 or more for moderately sized trees. The new version (0.0.7) is as usual available on GitHub. How to use and install this add-on is documented in previous articles: I II III IV. The new skinning method is the default if you uncheck the no modifiers checkbox but if you like you can still select Blenders skin modifier from the drop down as shown on the right. (This can also be done later because we leave the skeleton itself intact; as it only consists of edges it won't show up in renders but you could use it to add any modifier later on). The last line shows the results for a fair sized, bushy tree (400 endpoints, but with the internode length and kill distances reduced to 0.5 and 2.5 respectively and with 3000 extra endpoints per 1000 iterations). The difference between less than a second and more than 14 seconds is the difference between comfortable modelling and frustration, and there is still some room for improvement because the code is still riddled with print statements. we don't have to deal with special cases: the skin modifier can handle any geometry while our skinning just has to deal with straight edges or simple forks. 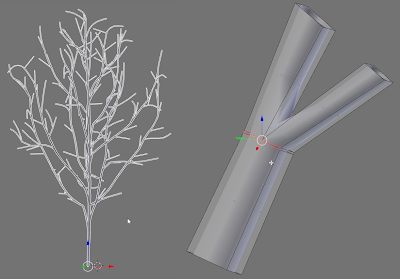 When we apply a subsurface modifier to our skinned branches the result is already quite acceptable although I see room for improvement, specifically in the shape of the forks. As you can see there is some bulging were the branches join and this is especially noticeable when there is either a very sharp anngle between the branches or when both branches bend out of plane. Fortunately the highlighted 5-gon lends itself to all kinds of angle dependant adaptations so I expect I can tweak this further to get smoother results. The focus for the next minor release will be on bug fixing and code cleanup to prepare for a full 1.0.0 release. This will be accompanied by better (hopefully: -) docs as well.